Nabtesco RV-N Inline Cycloidal Gear Reducers Based on their top-selling RV-E series reduction gears; Nabtesco has developed the equally powerful, yet smaller and lighter version, the RV-N series. Up to 20% smaller and 36% lighter (reducing inertia and improving load conditions) than RV-E gearboxes with equivalent performance, the RV-N series provides high ratio availability (up to 185:1) without increasing gearbox size. This new compact class of reduction gears achieves extreme precision with high torsional rigidity and low wear with less than 1 arc-min of backlash. Perfect for robotics, rotary tables, machine tools, or any application that requires high torque ratings but has limited space. A main bearing with integrated inner ring enables compact size, while reinforcement of the eccentric shaft bearing produces a very high power density. 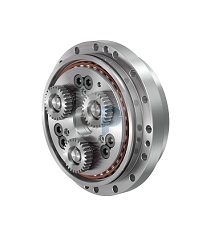 Integrated angular contact bearings for large thrust and overhung moment capacity, with torque capacity up to 5 times rated torque for emergency stops. All gear components were FEA optimized and subjected to special heat tempering resulting in high thermal stability and significantly longer service life. The RV-N series in available in a variety of sizes, with rated torques from 245 to 7,000 Nm, for numerous applications. Backlash less than 1 arc. min. Lost motion less than 1 arc. min.